Habit: Perennial herb 22--100 cm. Stem: erect, glabrous to hairy. Leaf: lower < 24 cm, oblanceolate, generally pinnately lobed; upper 2--10 cm, lanceolate, generally dentate to serrate. Inflorescence: bracts linear to lanceolate, entire to deeply 4--5-lobed, green. 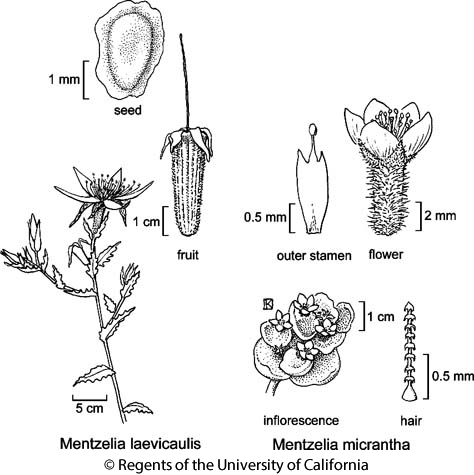 Flower: sepals 15--46 mm; petals 40--80 mm, 8--18 mm wide, adaxially yellow, tip acute; stamens 15--55 mm, filaments of 5 outermost 40--55 mm, 1--2 mm wide, linear, with anthers; style 2.5--7 cm. Fruit: erect, 15--44 mm, 8--13 mm wide, cylindric. Seed: 3--4 mm, 2--2.5 mm wide, lenticular, winged, gray. Chromosomes: 2n=22. Citation for this treatment: Joshua M. Brokaw, John J. Schenk & Barry Prigge 2012, Mentzelia laevicaulis, in Jepson Flora Project (eds.) Jepson eFlora, http://ucjeps.berkeley.edu/eflora/eflora_display.php?tid=33250, accessed on April 19, 2019.